As every business decision-maker should now know, the E.U. General Data Protection Regulation (GDPR) enforcement date is coming. The GDPR will be enforced starting May 2018 and will apply to those collecting, storing or using the personal data of the residents of the European Union’s 28 member states. The Regulation changes requirements around protecting the personally identifiable information of over 500 million people, and occupies the minds of anyone around the world concerned with data protection. 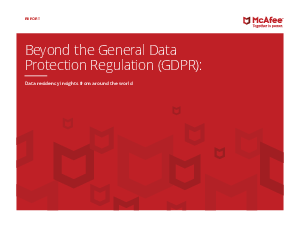 To better understand data decision-making, McAfee® commissioned Vanson Bourne to survey the views of 800 senior business professionals across eight countries around the world from a range of industry sectors.